OPC for Lurgashall is : Nobody yet! Why don't you volunteer? Lurgashall is a small village about 4 miles north west of Petworth. It has a triangular shaped cricket green. The attractive church of St Laurence has an unusual feature in that a 16th century gallery or cloister is built onto the south wall of the nave which once served and the village school but is now a vestry. The name Lurgashall is probably Saxon in origin, dating from the period following the Saxon invasion circa 500AD when a roving band of marauders may well have travelled along the Roman road from Chichester to London and settled on the site. Although the village is not mentioned in the Domesday Book, situated as it was in the dense forest of Wealden which was then considered to be of little value, Lurgashall was included in the fruits of victory which William the Conqueror handed out to his supporters. Although nothing remains of the original wooden Saxon building, the present Church shows clear signs of later Saxon architecture. The Tower, with its pointed arch, is Norman. Remains can be seen of an early font which was smashed by the Puritans in the Civil War. This bears signs of a lock to prevent the theft of Holy Water for superstitious purposes. Beneath is a ‘Resurrection Stone’ of immense weight which was hired out to prevent newly buried corpses from being stolen! The present font, of Sussex Marble, was first used on Lady Day, 1662, when the restored Charles II had reintroduced the Prayer Book and the ceremony of Baptism. The Lectern was presented in 1897 in memory of Alfred Lord Tennyson who lived nearby and was a regular worshipper at St. Laurence’s. 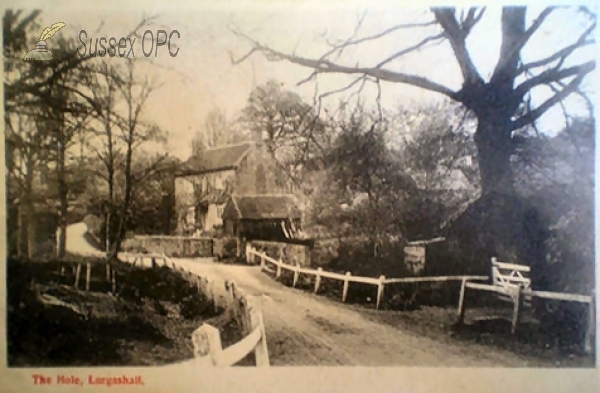 The watermill from Lurgashall has been moved to the Weald and Downland open air museum, where it once again produces flour. 771 individuals in the OPC Database for the 1841 census. 107 individuals in the OPC Database for the 1851 census. 18 individuals in the OPC Database for the 1881 census. 19 individuals in the OPC Database for the 1891 census. Grid reference: 493500, 127500 ~ View on: Google Maps, Open Street Map, Streetmap, National Library of Scotland Map or Oldmaps. The OPC database contains 54 poll register entries for people entitled to vote in this parish. There are 152 protestation returns for this parish in the OPC database. The OPC database contains 5 entries for people associated with this parish mentioned in Gazettes. There are 6 images depicting this parish in the OPC database.